The Ayton or Aytoun family originated in Berwickshire. Their influence spread to Fife and in 1539 a branch of the family was granted lands at Inchdairnie, near Kinglassie. 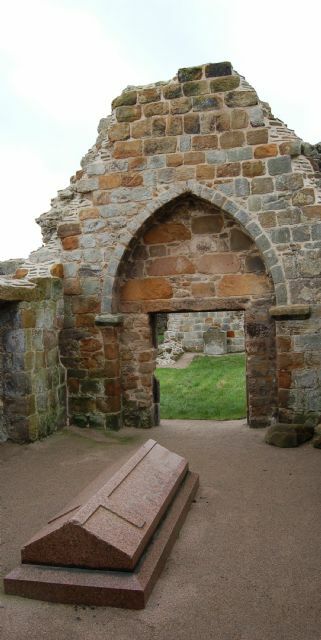 They prospered, and acquired other estates at Cardenden and Saline, and, around 1600, the estate then described as "Over Grange at Kinghorn Wester" - the Grange estate at Burntisland. They also had property in the south of France, where they spent much of their time. Roger was born in 1823, and inherited the family fortune at the age of eight on the death of his father. He had an eventful life, including a spell as the Liberal MP for Kirkcaldy from 1862 to 1874. In the early 1870s he presented the Inchdairnie Trophy to Burntisland Golf Club and this seems to have given a fillip to the game in the town. The first contest for the trophy took place on a course at the back of the Binn, on land which at that time belonged to Roger Aytoun. The trophy is still played for annually at an "away" venue. However, despite his achievements, Roger Aytoun had a serious weakness - a reputed addiction to gambling - and this led to his spectacular bankruptcy at the turn of the century. Great swathes of Fife went under the hammer at a London auction house on 18 December 1901 to pay off his debts. The Grange estate went too. At that time it comprised the Binn, Silverbarton Hill, the Grange and Kilmundy Quarries, Craigkelly and Grange farms and the principal estate residence, Grange House - a snip at £19,000 for the lot. Having lost everything, including his beloved Inchdairnie, Roger Aytoun retired quietly to London. He died there on New Year's Day 1904, and was interred in the family burial ground at the Kirkton, Burntisland. In the aristocratic custom of the day, they intermarried with the rich and famous, including the powerful Wemyss family. They produced enlightened farmers, military men, advocates and literary figures - one of whom is credited with the version of "Auld Lang Syne" which Robert Burns subsequently adapted.